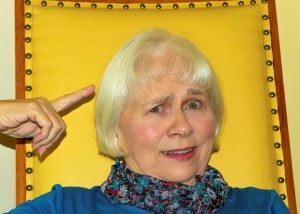 Stand-up comedy is a surprising pursuit for a white-haired grandma who blushes at f-bombs and prides herself on being authentic. I find my truth and then str-e-e-e-e-tch it to get laughs. Doing that gives an outlet to the little rebel in me who chaffed at colouring inside the lines. Here’s the video of my debut at the end of my first stand-up course. It was taped in a lecture hall because we couldn’t find a bar that wanted us at 10:30 in the morning. Here’s the video of my set at the end of my second course. This one was in a comedy club with a much larger audience than the first one.